Secondary Armament 1 x .303 Bren Machine Gun (Coaxial). 1 x .303 Vickers Machine Gun (AA Mount). Notes The Mk. II had many improvements over the Mk. I (which by now had been withdrawn for use as a training vehicle), it had a shorter 4x4 wheelbase and included four wheeled drive. Some early versions had an open topped turret mounting a .303 Vickers Machine Gun with a .303 Bren gun fixed in the hull and had double rear doors for access. Later vehicles mounted a Boys anti-tank rifle as well as the Vickers and a Bren with hatch doors providing overhead cover, but the Marmon Herrington could be, and was armed with anything that the British could lay their hands on, including captured German and Italian ordnance. The Mk. 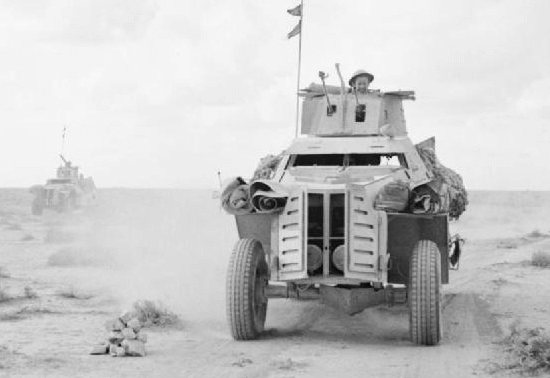 II saw action with South African, British and Indian reconnaissance units in Africa, Malaya and India before being replaced by the more modern type Humber and Daimler.